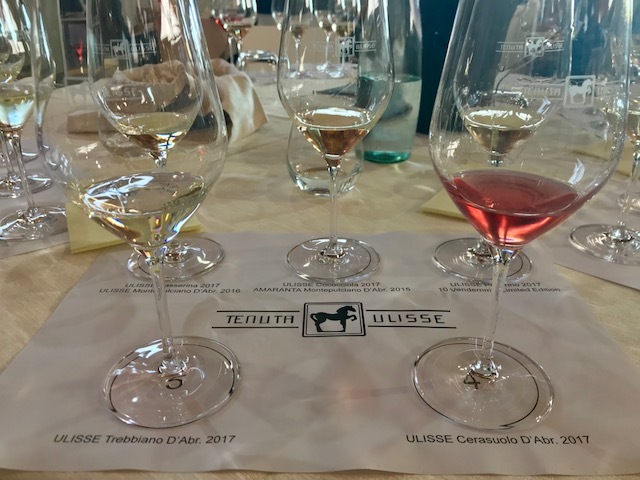 Our final winery visit on the Abruzzo wine tour was at Tenuta Ulisse which is located in Crecchio in the Chieti province. The family firmly believes in the winemaking traditions of the region, almost 90% of their grapes are pergola trained. 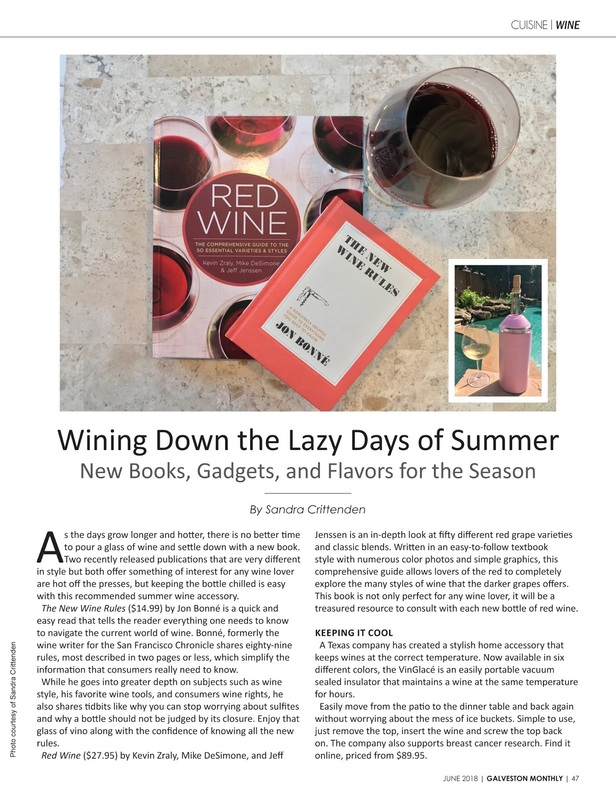 They believe the classic training technique works best with the region's terroir in giving them the greatest flexibility in creating shade or allowing more sun to reach the grapes as needed. The winery is state of the art. They press in an oxygen free environment. They use cryoselection or cryoextraction to determine the most sugar rich grapes. Fermentation is low and slow. 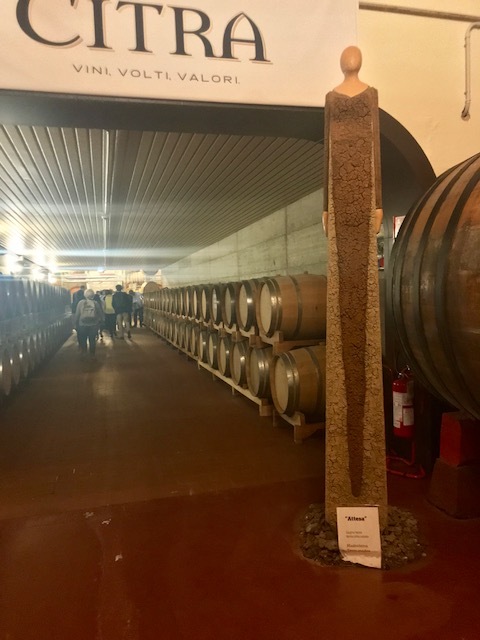 They chose a restrained approach to using oak barrels as they prefer to showcase their fruit and their labor in the vineyard. 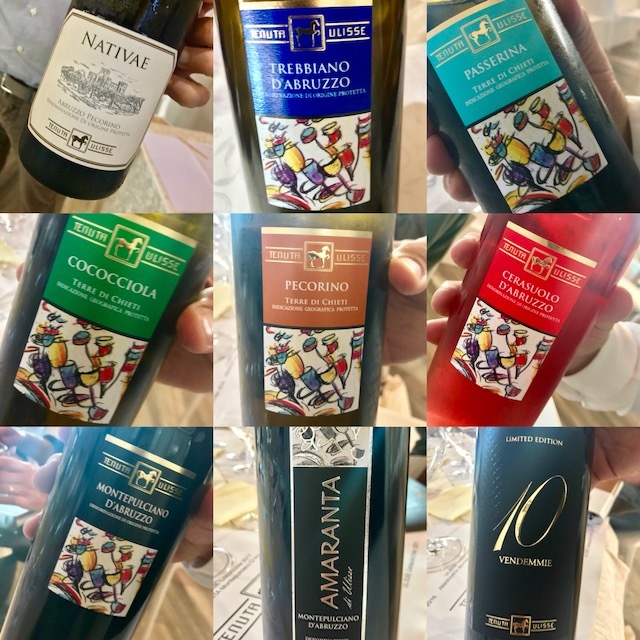 Trebbiano 2017 - The grapes for this wine come from a sandier area of the vineyard. Fresh, grassy, grapefruit citrus flavors with good acidity. also grown on sandier soils closer to the sea. Fruity with white peach and chamomile with fresh acidity. Cococciola 2017 - Elegant, delicate, light floral notes with citrus aromas and flavors of lime and grapefruit with a light mineral finish. Pecorino 2017 - This is their main white wine. Tropical aromas with mango and citrus, fresh mineral note with a hint of balsamic on the finish. 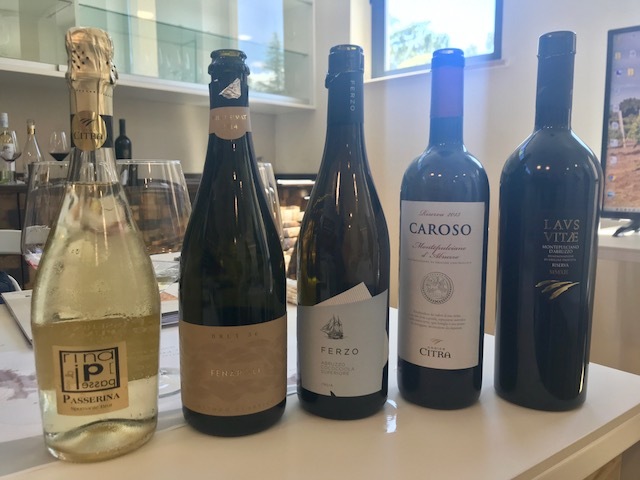 Cerasuolo 2017 - Nice texture with raspberry aromas and flavors with fresh acidity and light tannins. Montepulciano d'Abruzzo 2016 - Fruit forward with cherry and raspberry, no oak. Soft tannins, easy and smooth. Amaranta Montepulciano d'Abruzzo 2015 - Sourced from a 55 year old vineyard, this wine had aromas and flavors of ripe dark plums and berries, a floral note of violet with a touch of vanilla, it was full bodied with smooth ripe tannins and had a persistent finish. 10 Vendemmie Limited Edition - Multi-vintage red wine combining 10 years of Montepulciano which is aged in French oak. Dark, rich and intense yet soft, round and approachable. 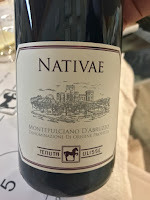 Nativae Montepulciano d'Abruzzo 2015 - Sweet blackberry aromas and flavors with smoke and graphite, velvety tannins, nicely balanced with a smooth, lingering light mineral finish. My favorite of this tasting. After enjoying the prior red wine so much, they opened the following unplanned white for us to try before we left. Both of these wines are fermented with wild, native yeast. 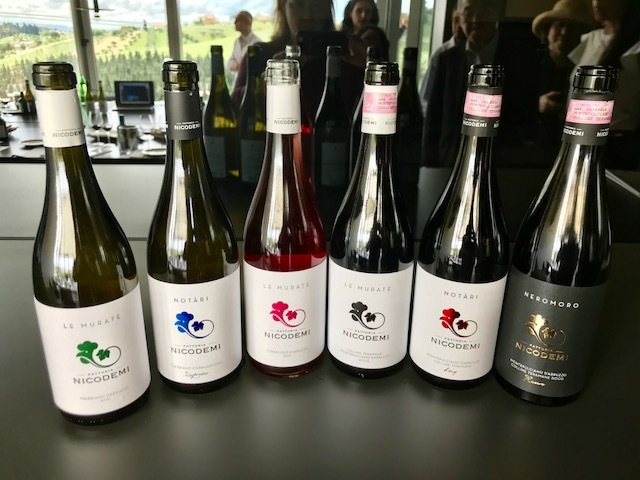 Nativae Pecorino 2016 - Fresh, crisp and fruity with a mineral laced finish. 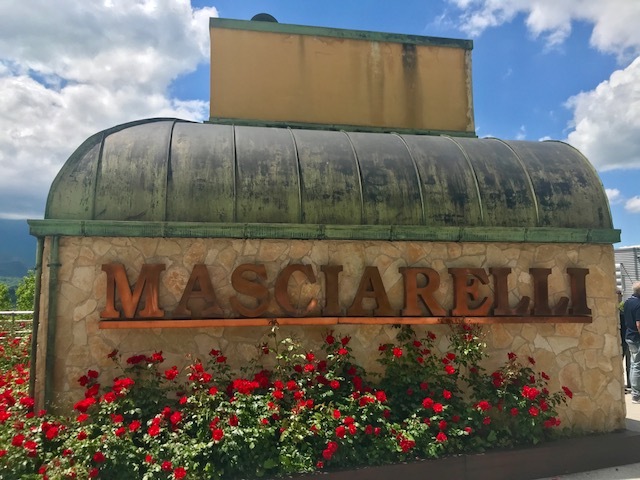 Our second stop of the day was at Masciarelli Winery which is also located in the Chieti province. Open daily to receive guests by appointment, this winery was one of the most tourist friendly to visit. 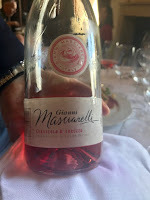 Masciarelli was founded in 1981. They have 18 labels and 5 product lines. 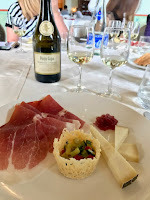 We took a quick tour of the wine making facility and then went to Castello di Semivicoli for a tasting lunch to try the wines. Typically, guests would taste in the shop next to the cellar but you can also book a tasting at the castle. been renovated into a luxury boutique hotel by by Masciarelli owner, Gianni Masciarellli. I sat across from a window which gave me beautiful views throughout lunch. It also distracted me so I did not take the best notes. 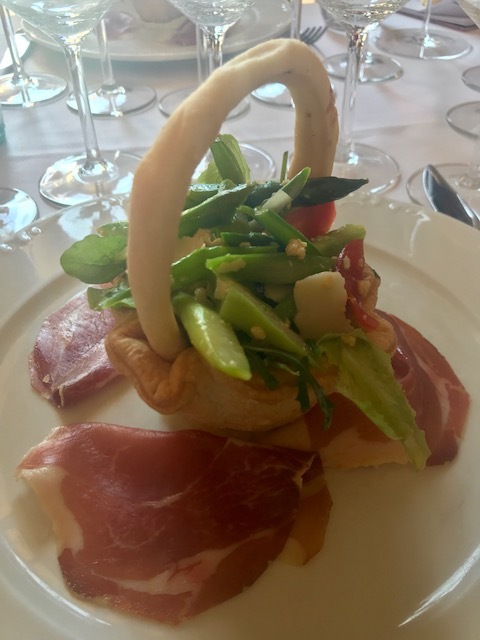 I can tell you that the wine and food were delicious, the company was enjoyable, the views were spectacular and the ambience reminded of a more genteel time. The hospitality was so nice that I forgot I was working. 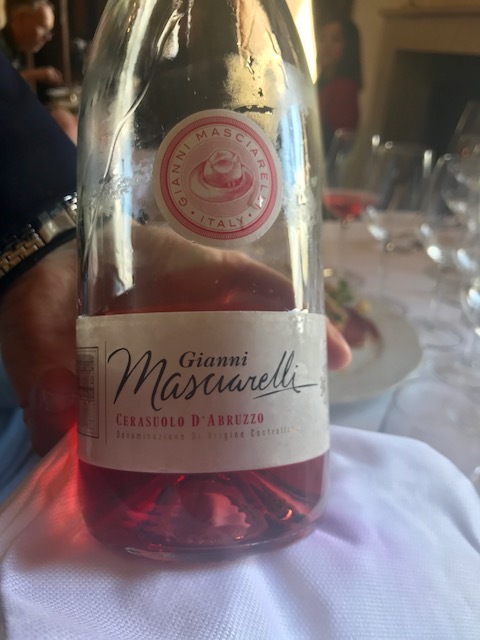 Gianni Masciarelli Cerasuolo d'Abruzzo 2017 - No notes, I was admiring the color in my glass along with the view out the window and the view on my plate. 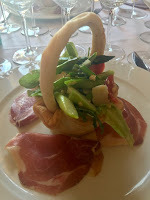 We started with an individual bread basket filled with salad and prosciutto that was perfect with the wine. Masciarelli Castello di Semivicoli Trebbiano d'Abruzzo 2014 - This easy white was fermented in stainless steel with 12 months contact with the lees, it was medium bodied, smooth and fruity with pear and citrus, a lovely complement to the saffron risotto which came next. 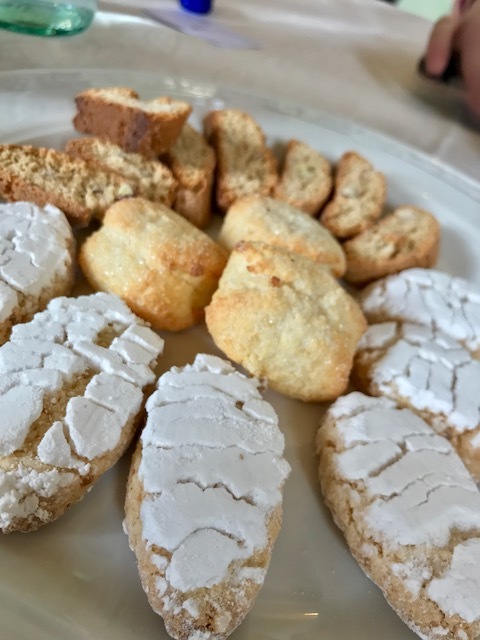 A'Bruzzo fun fact- Saffron has been in the region for over 400 years, the amount produced is small but the quality is considered to be quite high. 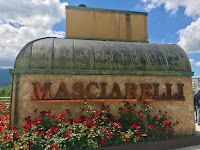 Masciarelli "Johnny's Barrel" Trebbiano 2013 - Served in a Burgundy glass during the risotto course, this bottle was number 200 of 900 bottles. It was aged for 28 months in French oak. This was one of my favorite whites of the trip. Dry with aromas and flavors of honey, lemon citrus and a distinct mineral-laced finish. Marina Cvetic Montepulciano d'Abruzzo 2013 - Bright aromas and flavors of dark berries and plums, medium bodied with good tannins and acidity with a slightly spicy finish, great with food, delicious with the pasta course. Masciarelli "Johnny's Barrel" Montepulciano d'Abruzzo 2013 - This bottle was number 654. That was the end of my notes, we were served two more wines after that one. All three of these red wines were delicious with the meat and potatoes. 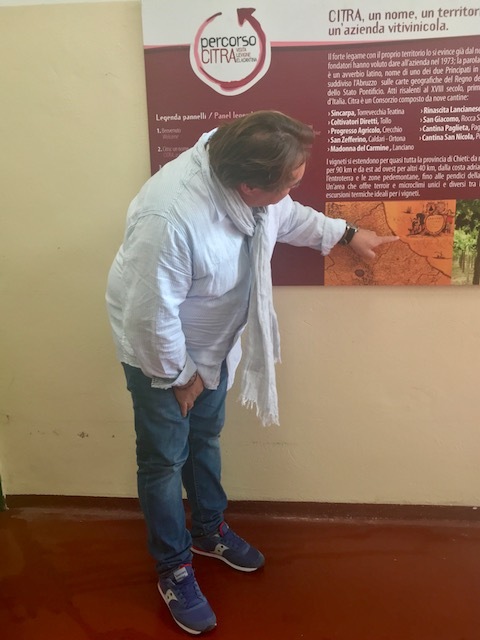 After dessert, we walked off our lunch with a tour of the vineyards around Castello di Semivicoli. 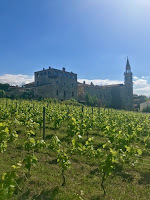 There is a large swimming pool out amongst the vines for hotel guests to cool down after a day spent at the beach, out wine tasting or sight seeing. The lunch service was impeccable, the building was elegant and the grounds were scenic, it truly looked like a lovely place to stay. Neighbor Luigi Valori joined us in the vineyard to talk grapes, terroir and green pruning. It was a very informative afternoon perfectly paired with a beautifully prepared lunch. All of the above wines are highly recommended. Our first stop on our final day of touring was at Codice Citra which was founded in 1973. Codice Citra was quite the change from the smaller family wineries we had visited so far. It has 9 cooperative wineries with 3,000 associated winegrowers in the group. They produce about 20,000,000 bottles from over 14,000 acres each year. 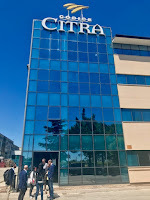 Codice Citra has a large and impressive facility. 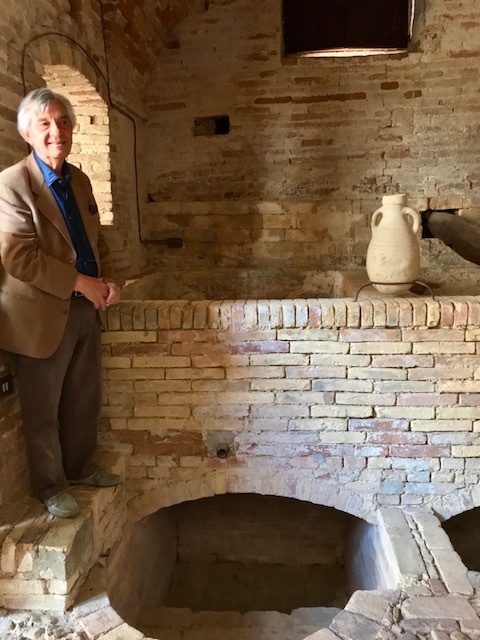 They have the largest cask room in central and southern Italy with the capacity to refine or age close to 200,000 gallons of wine. 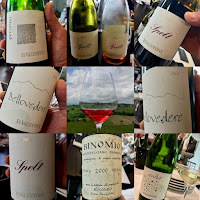 While most of their wines are made from indigenous grapes, they do also make some international varieties. 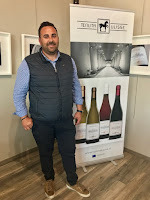 They are the largest exporter of Abruzzo wines in the world with a presence in 50 countries, this is primarily due to the good quality/price ratio that the company delivers. The wines made by Codice Citra come from the province of Chieti. 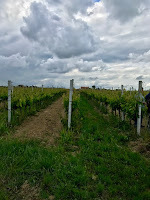 The vineyard area stretches inland 25 miles from the Adriatic Sea. 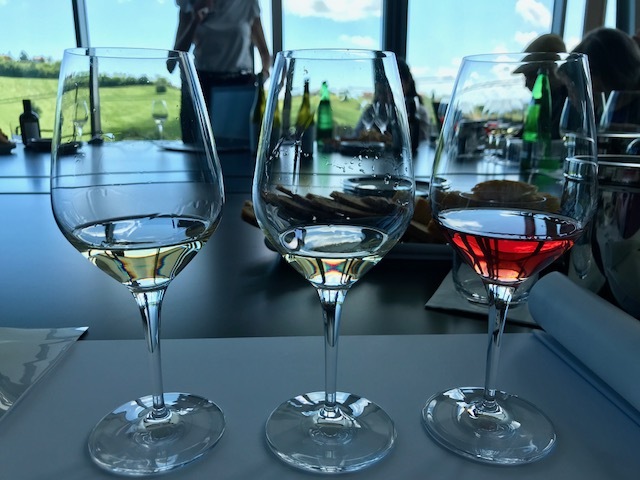 They began their commitment to sustainable energy and the environment in 2011 with the production of a photovoltaic power plant to run the consortium's wine production. 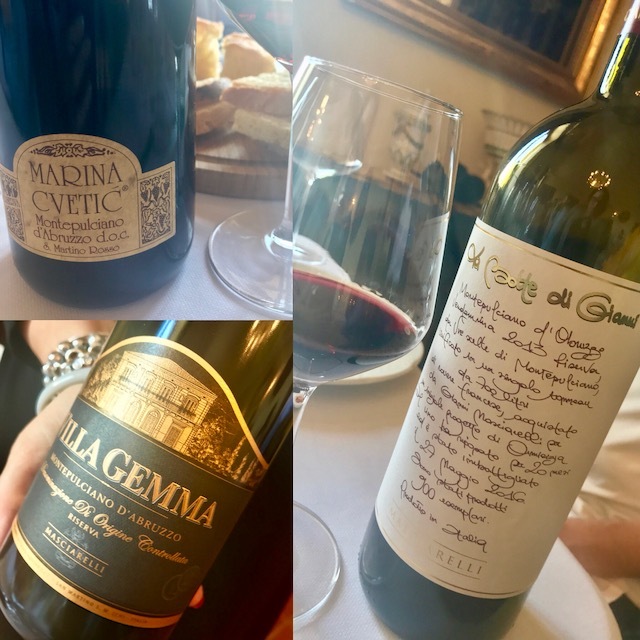 Their next goal is to continue to improve quality and value with a collaboration with the World Assoenologi President, Riccardo Cotarella and their head winemaker, Lino Olivastri. 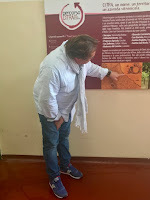 Lino Olivastri led us through the winery and showed us the latest projects he is working on. He seemed most excited about the classic method sparkling wine. 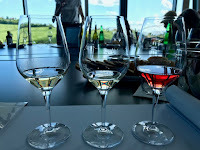 We then went down to their modern tasting room to try the wines. Passe "Rina" Spumante Brut - This tank fermented sparkler made from Passerina grapes had floral aromas with white peach and citrus with a light yeasty note in the finish, the winery recommends it both as an aperitif and as an after dinner sipper. Fenaroli Montonico Spumante Metodo Classico 2014 - This classic method sparkling wine is made from 100% Montonico, a local white grape, it spends 36 months on the lees before disgorgement. The wine is dry, crisp, and citrusy with apple and yeasty bread in the lingering finish. Ferzo Cococciola Superiore d'Abruzzo 2017 - Floral notes of wisteria with nectarine and grapefruit, dry, fresh, fuller bodied, and persistent. 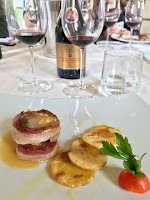 Caroso Riserva Montepulciano d'Abruzzo 2013 - Only produced in the best years, the grapes for this wine were sourced from sandier soils, this red had dark berry aromas and flavors with hints of licorice, fresh acidity, and an elegant slightly balsamic finish. berries with dark chocolate, toasted nuts and a mineral-tinged finish. An amazing high tech facility combined with local family growers, all of these wines are recommended. 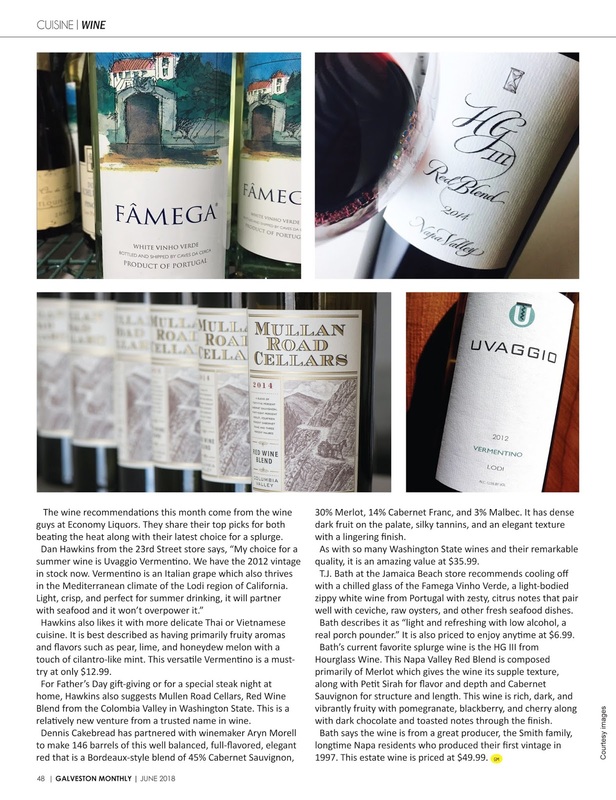 Also, check out winemaker, Lino Olivastri, in Citra's video for their Sheep Thrills wine and see some of the Abruzzo terroir. 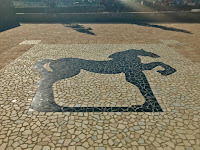 VINI CITRA - Sheep Thrills from TOART on href="https://vimeo.com">Vimeo. 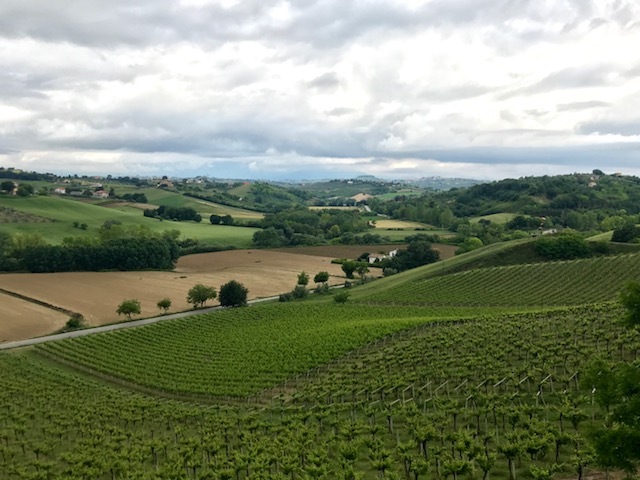 On day two of touring Abruzzo vineyards, we started at Fattoria La Valentina which is located in Spoltore in the Pescara province. 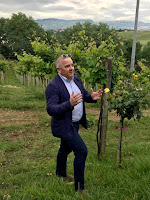 One of the owners, Sabatino Di Properzio met our group and took us out to tour the estate Bellovedere Vineyard before our tasting. 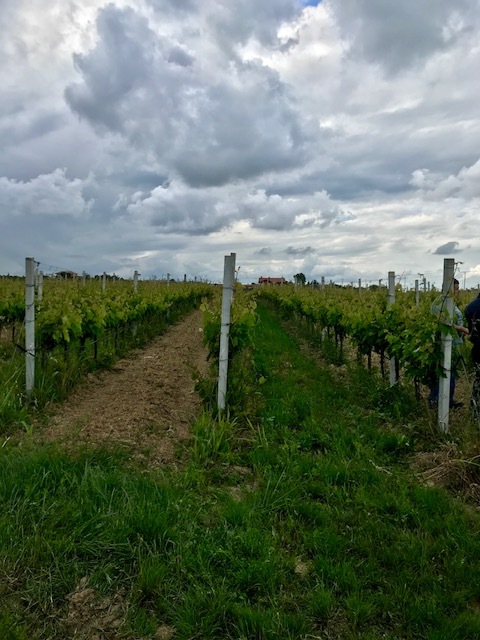 The vineyard sits just a couple of miles from the Adriatic Sea, that coupled with the cool mountain breezes brings out the best the grapes have to offer. He felt it was important to share that the vines are all pergola trained. 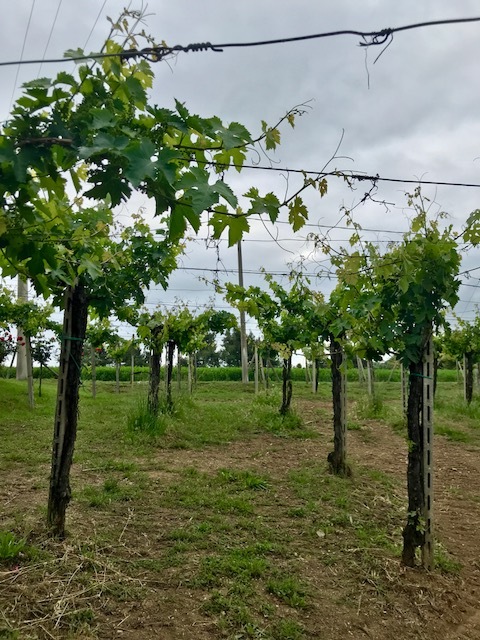 Their goal is to intervene as little as possible although the vineyard does have water misters which are only used as needed for troubled spots. The oldest vines are 47 years old, they use what he called "a French approach" changing out plants only as needed. The vineyard is sustainably managed. In the winery, they prefer small French oak barrels with a low toast. The Binomial, one of their single vineyard wines, is refined in barrique. 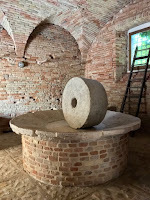 Sabatino Di Properzio says, "Barriques are used to obtain the best from a wine not to add flavor." The partners continue with plans to expand by increasing their vineyard holdings. The Spelt label is their attempt to link the Germanic background of the area to the wine. It is based both on legend and history. La Valentina Pecorino 2017 - Fresh, vibrant, concentrated zippy citrus aromas and flavors, round feel with a slightly creamy finish. 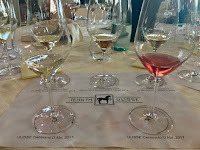 La Valentina Spelt Trebbiano d'Abruzzo Superiore 2017 - Light, fresh and crisp wit a red apple nuance and a mineral laced finish. 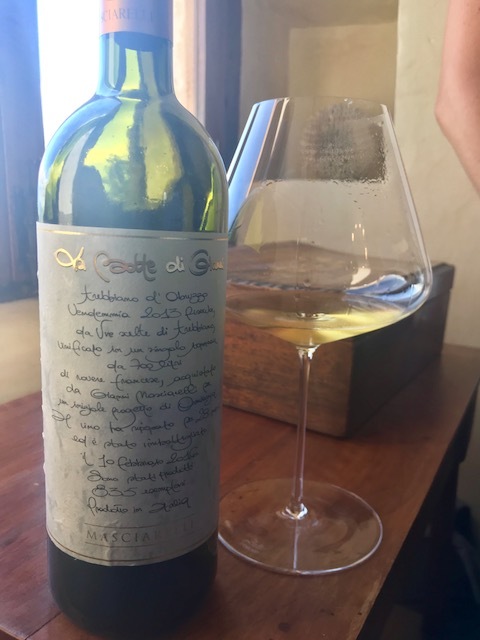 La Valentina Spelt Cerasuola 2017 - Fragrant fruity ripe red berries with a pithy finish, dry, full body, lightly tannic, with clean, crisp acidity. La Valentina Spelt Montepulciano d'Abruzzo 2014 - Aromas and flavors of sweet mixed berries with a spicy note, a more rustic style, more tannic. Binomio Montepulciano d'Abruzzo 2014 - Sabatino Di Properzio described this wine as the mountain expression of their two single vineyard wines. Rich and concentrated with dark fruit, blackberries, plum, black pepper, ripe tannins and a raspberry finish. 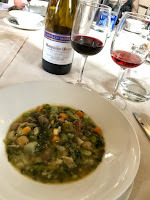 La Valentina Bellovedere Montepulciano d'Abruzzo 2013 - Sabatino Di Properzio described this wine as the coastal expression of their two single vineyard wines. Floral with dried herbs over mouth filling flavors of mixed berries with a slight saline minerality. Spelt Montepulciano d'Abruzzo 2003 - From a hotter vintage, this wine displayed more tobacco, dried herbs with a hint of balsamic over black plum. La Valentina Bellovedere Montepulciano d'Abruzzo 2006 - Floral notes of violet with ripe red plum, dried herbs and a hint of balsamic with a bigger structure, full body, velvety tannins and a persistent finish. My favorite red in the tasting. Binomio Montepulciano d'Abruzzo 2000 - Smoky tobacco, sandalwood, dried plum with a sherry note in the lingering finish. La Valentina Auha Fiano - Floral and fruity with jasmine, apricot and grapefruit with a fresh, lingering finish. 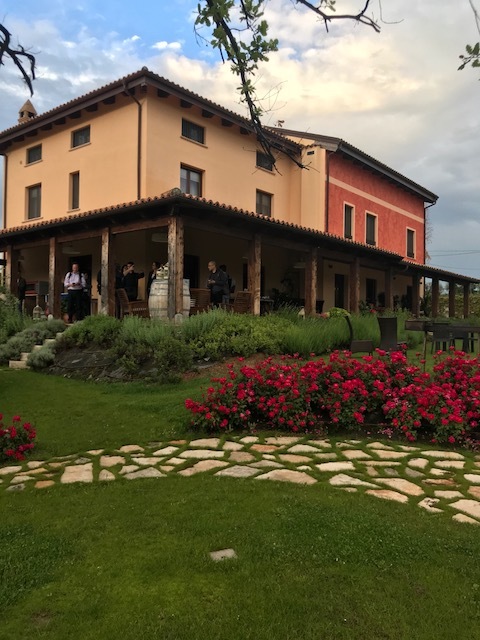 We wrapped up our tour of wineries in the Teramo province with a tour and a dinner tasting at Emidio Pepe. 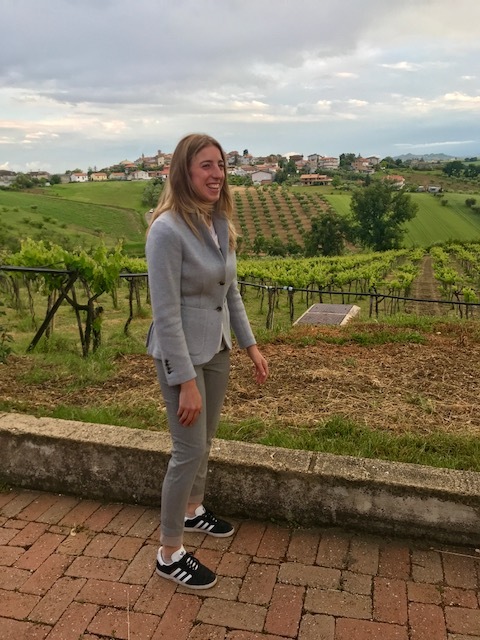 Grandaughter Chiara Pepe shared the family's history and their winemaking philosophy as she strolled us around the house, the winery and the vineyards. Chiara explained, though they did become certified organic in 1998 and biodynamic in 2006. 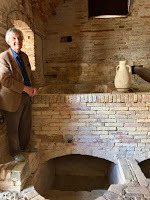 As Chiara showed the concrete tanks that Emidio Pepe prefers as he feels they help to achieve a more elegant style while also ensuring that his hard work in the vineyard is not changed in the cellar, Emidio Pepe himself, aka Mr. Montepulciano, joined us. 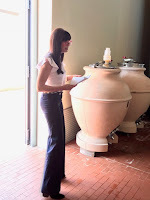 As they described the production process, Chiara said that de-stemming by hand was the second most important step in making a quality wine. The first was a spontaneous fermentation from indigenous yeast, "You can't have a wine that talks about a place without natural yeast," she stated. The family grows organic wheat on the property to make pasta and bread as well as growing other fresh produce. Eliminating modified foods from their diet was important to achieving the quality of life they prefer for their family. Guests that stay in one of the property's guest apartments can reap the rewards of the family's organic lifestyle, as well. 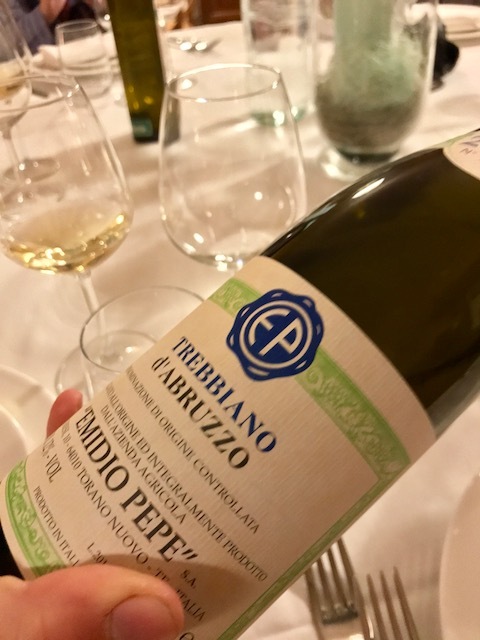 Emidio Pepe Trebbiano 2014 - Fresh, dry and fruity with grapefruit, nectarine, and a mineral-laced finish. Emidio Pepe Trebbiano 2013 - Also, fresh, dry and fruity with grapefruit, nectarine, and a mineral-laced finish. Emidio Pepe Trebbiano 2004 - Fresh, dry and citrusy with a touch of honey over the mineral-laced finish. Emidio Pepe Montepulciano d'Abruzzo 2010 - Fruity with plum and raspberry, with a soft, rounded velvety feel, generous and complex with a persistent finish. elegance and power, still bold but showing some signs of maturity. The weather was similar to 2010. Velvety tannins, good acidity with juicy plum and leather notes in the lengthy finish. Emidio Pepe Montepulciano d'Abruzzo 1983 - Emidio Pepe said this wine was originally too big, too powerful and too dark. He waited several extra years before releasing it and now describes it after its evolution as a sheer, elegant wine with a long and persistent finish. I found aromas and flavors of dried fruit with earth, leather, and a savory cured meat note in the lingering finish. Complex and interesting and very enjoyable now. 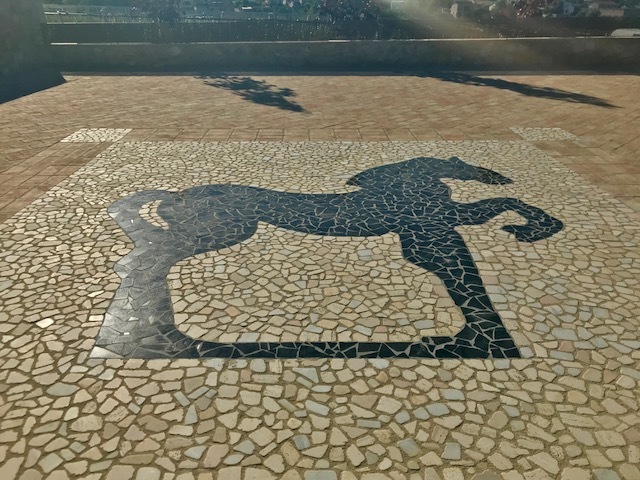 This winery was founded as Fattoria Nicò or Nico's Farm in 1890 by Nicola Illuminati. It would grow substantially by the 1970s under the direction of his grandson, Dino, with the purchase of more vineyard land. Today, the family at Azienda Agricola Dino Illuminati oversees more than 300 acres between the Adriatic Sea and the Gran Sasso mountain. 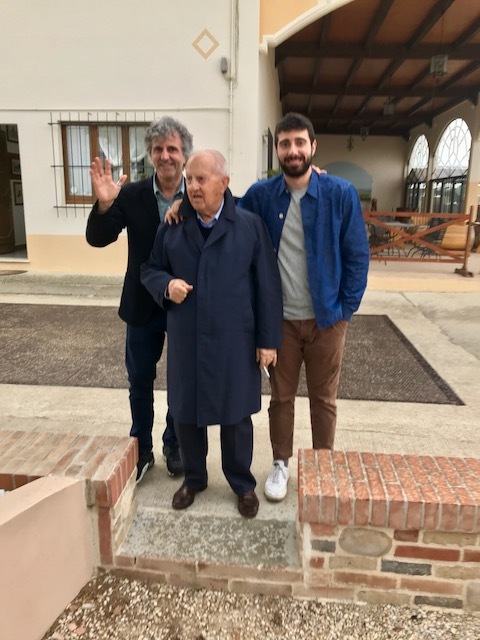 Dino's son Stefano and his grandson Nicola met our group out in the vineyard where we immediately saw the signs of a sustainably maintained vineyard with every other row alternating between grassy cover crops and vineyard dirt. 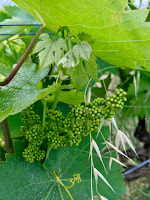 Baby grapes were taking shape out on the vines under an ominous late afternoon cloud cover that quickly cooled the warm spring temperatures down. We snapped a quick group photo and headed to the winery. 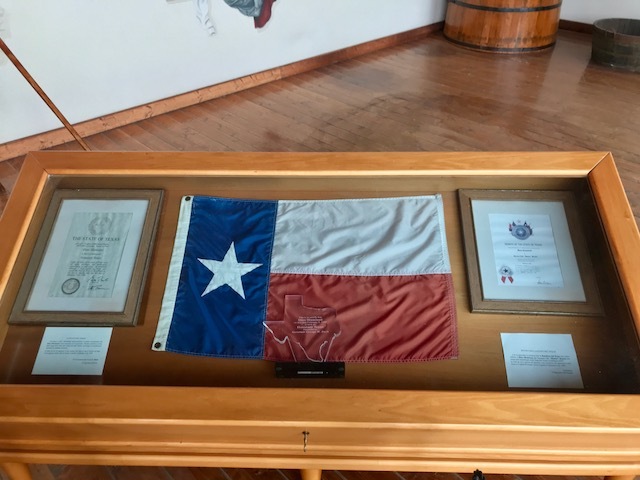 When we arrived to the covered patio, no one was more surprised than me to find the Texas flag on display. 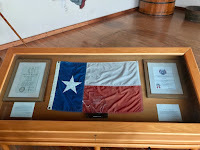 There will be more on that in an upcoming issue of Galveston Monthly magazine so stay tuned, the gist is that Dino Illuminati is an official honorary Texan. Dino emerged from the offices where he is still onsite to oversee things and give us a quick meet and greet before our tasting. I took the opportunity to quickly photograph the three generations of Illuminati men who were influencing the wines that we were about to taste. 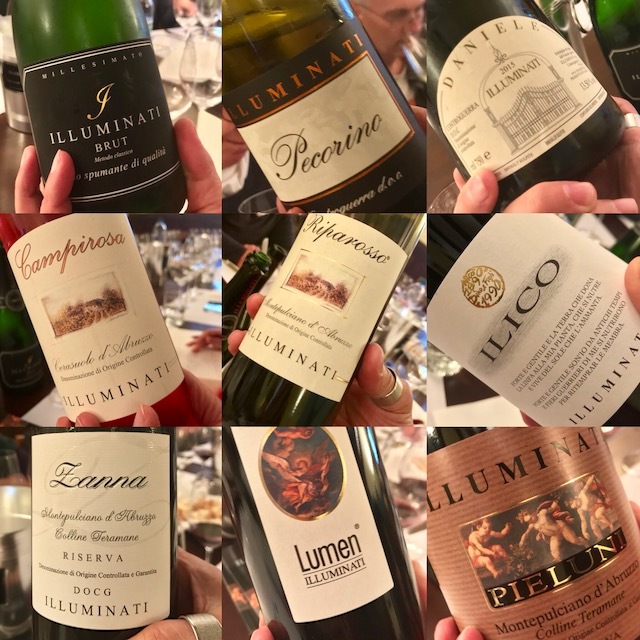 Illuminati Brut 2017 - This wine was a delightful surprise with which to start, a sparkling white wine made in the traditional Champenoise method out of 60% Trebbiano and 40% Verdicchio from grapes sourced from their own Controguerra vineyards. Light and fresh with a creamy texture from its 30-36 months on the lees with elegant notes of citrus and apple through the lingering finish. A perfect start to any meal and an excellent choice for simple seafood dishes. 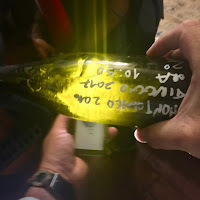 situated over 800 feet above sea level, this crisp, clean white has citrus, fresh herbs, and a touch of almond with a persistent mineral laced finish.Illuminati Daniele 2015 - This is a fuller bodied white wine blend of Trebbiano, Passerina and Chardonnay, it has rich fruity flavors of apple and pear with a smooth, easy finish, an excellent complement to heavier seafood dishes. Illuminati Campirosa Cerasuolo d'Abruzzo 2017 - Another dark cherry-colored dry rosé from Montepulciano grapes, this refreshing dark pink wine had mixed ripe berry aromas and flavors with a light floral note, perfect with charcuterie and mild cheeses or poultry dishes. Illuminati Riparoso Montepulciano d'Abruzzo 2016 - This approachable red wine is aged in 25 hectoliter Slavonian oak barrels for 7-8 before being bottled and cellar aged for another 3-4 months. Red cherry aromas and flavors with a bit of licorice and a light leathery note make this soft, full bodied red the perfect everyday wine for simple meals like pizza or hamburgers. Illuminati Ilico Montepulciano d'Abruzzo 2015 - Stefano said this wine was made in the more classic rustic style, it had sweet berry aromas and flavors with some vanilla and a raison note, try it with braised red meat. 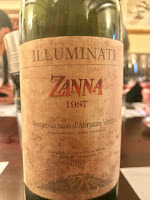 llluminati Zanna Montepulciano d'Abrruzzo Colline Teramane DOCG Riserva 2013 - One of the first vineyards ever planted on the farm is the source of this fruit, it receives regular cooling breezes from the sea that help the grapes maintain their acidity and keeps the vines disease free. This wine was a favorite of George H.W. Bush and his wife, Barbara. Blackberries and a floral note combine with a full body, velvety tannins and an elegant slightly spicy mineral-tinged lingering finish, enjoy with a grilled ribeye or blue cheese burger. 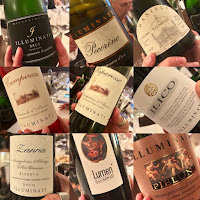 Illuminati Lumen Controguerra Rosso Riserva 2011 - Produced only in the best vintages from a blend of 70% Montepulciano and 30% Cabernet Sauvignon, this wine had mixed ripe red fruit aromas and black berry flavors with a full body, bigger structure and persistent finish, pair with red meats or game. Illuminati Pieluni Montepulciano d'Abruzzo Colline Teramane Riserva 2011 - The harvest for the grapes for this wine is later giving the wine intense aromas and flavors of ripe mixed berries with vanilla and tobacco, rich, round and lingering, serve this with roasted lamb or mature cheese. and powerful, dark berries and a smoky note continue through the slightly savory finish. The two wines did not appear to have an eleven year age difference. 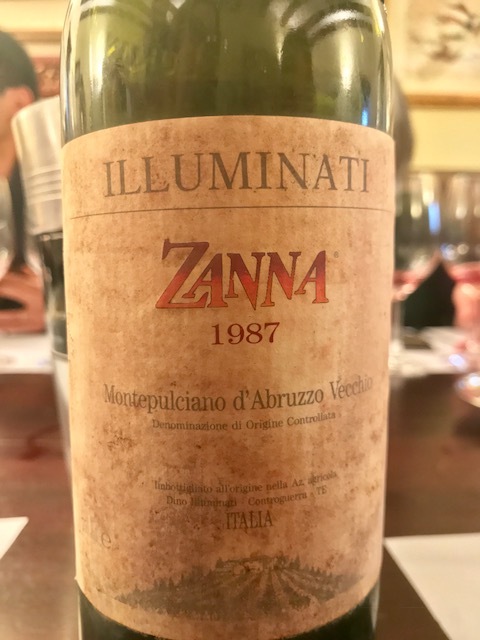 We also had the opportunity to enjoy the llluminati Zanna Montepulciano d'Abrruzzo Riserva 1987 which was also surprisingly young and a delight to drink. All of the above wines are highly recommended. 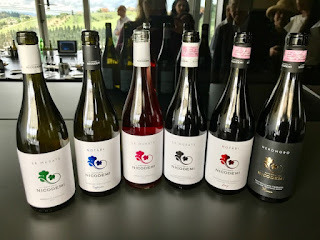 My first stop on the Abruzzo wine tour was at organic wine producer Fattoria Nicodemi which is located in the town of Notaresco in the Colline Teramane DOCG. 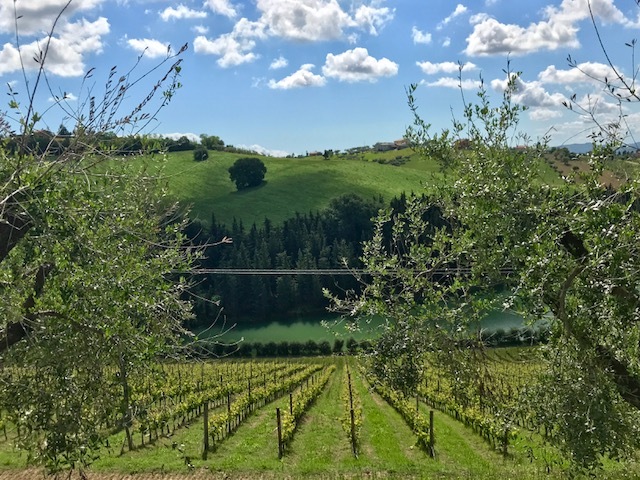 This DOCG was originally part of the larger Montepulciano d'Abruzzo DOC but became its own distinct growing area with new stricter regulations in 2003. The name translates to the hills around Teramo and is considered to have a more favorable climate that leads to superior tannin development. The production area is small with less than 300 acres under vine, rules involve smaller yields and a longer required aging period. 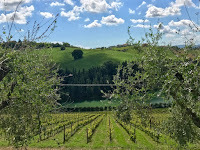 Fattoria Nicodemi has almost 75 of these hillside acres and produces about 200,000 bottles a year. Elena Nicodemi met our group and took us out onto a terrace that oversees the vineyards to share her thoughts on the terroir of Colline Teramane. 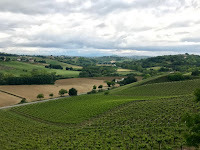 The vineyard sits at 1000 feet above sea level and has a medium textured mix of limestone and clay soil which, she said, is typical for the area. The vineyard area appeared lush and green, almost surreal like a painting of what a perfect vineyard should look like. 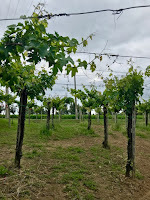 The vineyards are farmed organically with no chemical herbicides, pesticides or fertilizers and new vines are sourced from their heirloom vines through mass selection when new plantings are needed. 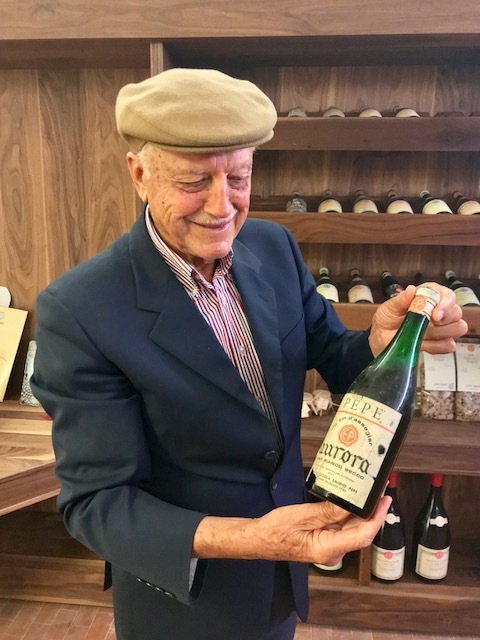 Her father, Bruno Nicodemi, started the winery in 1970 after receiving the estate from her grandmother which at the time was just a typical country farm. 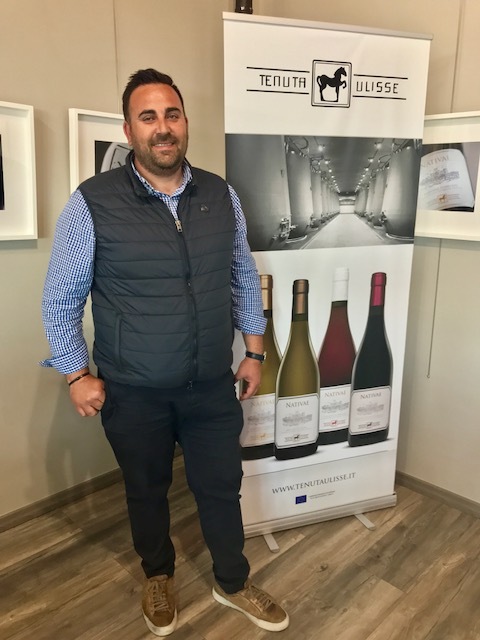 He wanted to produce quality wine for bottling versus selling his grapes for bulk wine production, this was an unusual idea at that time, the region was not known for quality producers though there were already some with the same vision. He converted the land to vineyards and produced his first vintage under his own label in 1977. 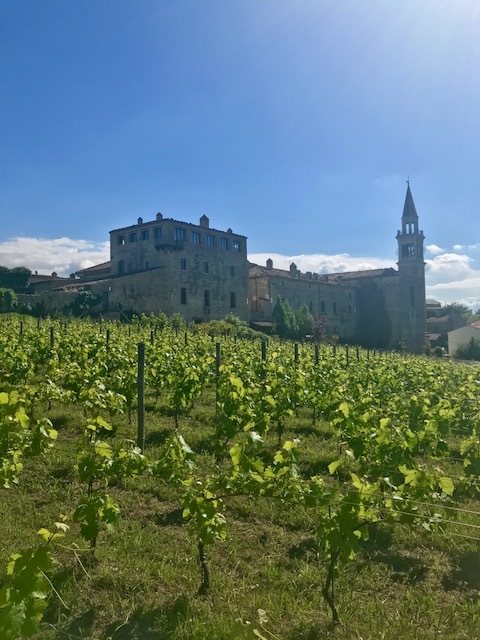 Though neither she nor her brother planned on becoming winemakers, Elena was an architect and her brother an economist, they both changed their plans and joined the winery in 2000 to fulfill their father's dream. They replanted some vineyard plots to gain more southeastern exposure, designed new labels and expanded the range of wines being produced. 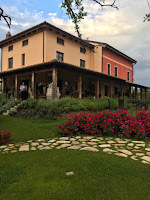 They were careful to maintain their oldest pergola trained vines which they use for their Riserva bottling. Fattoria Nicodemi only produces wine from their own land, they do not buy additional grapes from growers. Their goal is to produce wine that is an expression of their land, their vines and their culture. 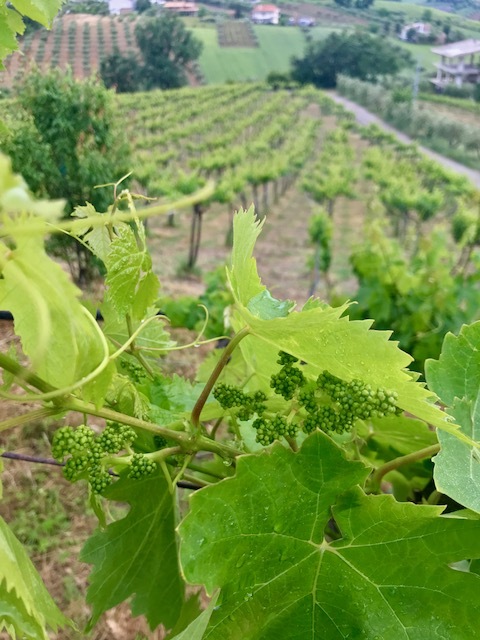 The production is only from native varieties, 70% Montepulciano and 30% Trebbiano. They are trying some experimental winemaking with alternative neutral vats made from sand, cement and brick fragments that allow for micro-oxygenation over a two year time period. They are different than the tera cotta urns more often seen in that they are not baked. Elena described the material as more like what the ancient Romans used to build the aqueducts. The wine was not at a point to be tasted yet but they are excited to see the end results. 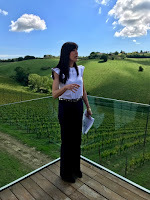 After our tour, we went into the beautifully designed tasting room with its expansive vineyard views to try the wines of Fattoria Nicodemi. Le Murate Trebbiano d'Abruzzo 2017 - Fresh, crisp and tangy with lemon citrus and a light herbal component, an easy drinking wine for light seafood salads, vegetarian fare or seafood crudo. Notàri Trebbiano d'Abruzzo Superiore 2017 - This wine was aged on its lees for 3 months longer than the previous wine and had a three months longer bottle aging period. 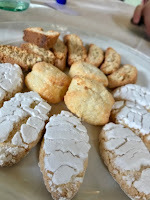 Elena said this white was more typical of the style that most Abruzzese drink. 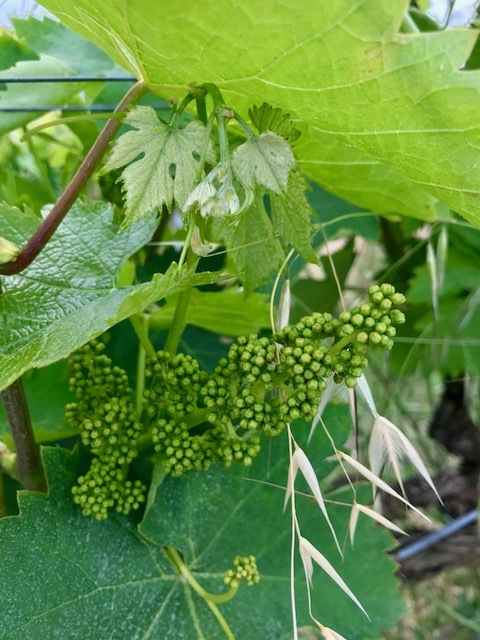 Similar to the first wine with citrus and herbal notes, this wine also had a bit more of a floral character, a softer texture and a more distinct and lingering mineral finish. An ideal wine for heavier seafood dishes, saffron chicken or grilled polenta. 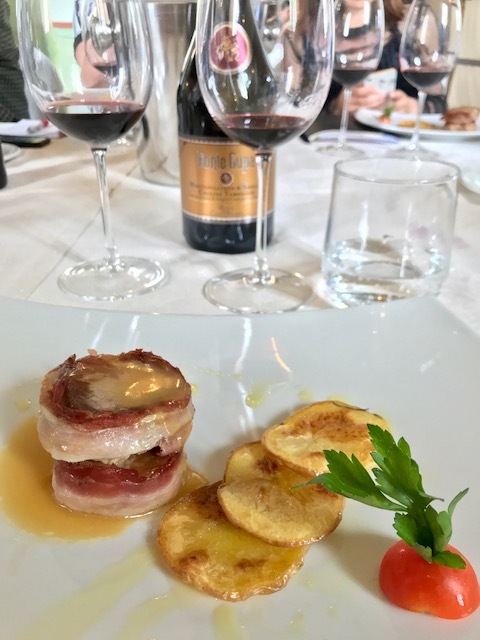 Le Murate Cerasuolo d'Abruzzo 2017 - Fruity aromas and flavors of pomegranate, raspberry and orange peel balance perfectly with fresh acidity, a round feel and a lingering mineral finish, a perfect choice to pair with either charcuterie or salad. Le Murate Montepulciano d'Abruzzo Colline Teramane 2016 - From a cooler year, this wine showed intense dark fruit aromas and flavors of black cherry and blackberry with floral hints of rose and spicy cinnamon adding interest. Rich and flavorful yet still elegant with fresh acidity, velvety tannins, and a persistent finish. Serve this with barbecue, roasted meats or savory meat based sauces. Notàri Montepulciano d'Abruzzo Colline Teramane 2015 - From a warmer and drier vintage, this wine displayed pronounced blueberry aromas and flavors with hints of lavender, cloves and a balsamic note, fresh and tangy with smooth ripe tannins and a deep blackberry mineral-laced finish, a classic choice for for the lamb dishes of the area or a great wine to try with spicier cuisine. Neromoro Montepulciano d'Abruzzo Colline Teramane Riserva 2013 - Sourced from a single plot of 45+ year old pergola trained vines, this wine showed mixed black cherry and berry aromas and flavors with a light floral note, red pepper and a balsamic essence in the long finish. Intense and rich yet still fresh, smooth, and well balanced, this wine is perfect for classic pasta dishes or roasted or barbecued meat. 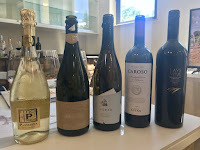 All of the above wines are highly recommended, they reflect the passion and the elegance of the family and give a true taste of this special area of Abruzzo.